ESO Supernova Exhibition — How do stars explode? Massive stars go bang at the end of their lives. 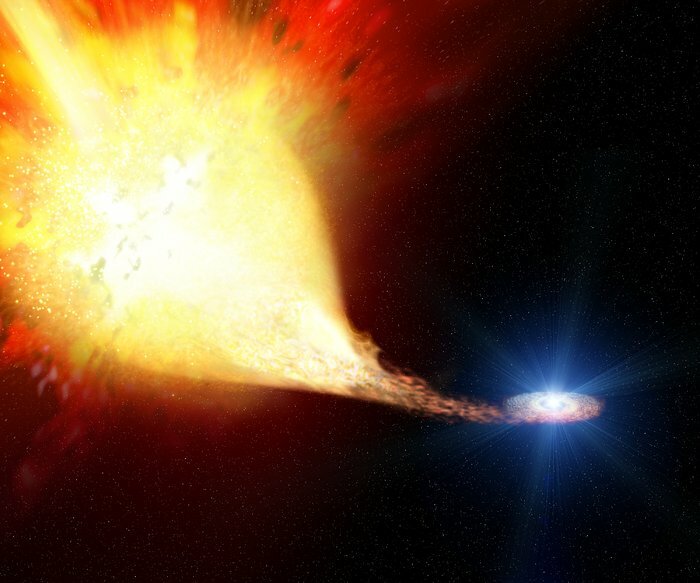 White dwarf stars can explode, too, when too much gas is dumped on their surface. 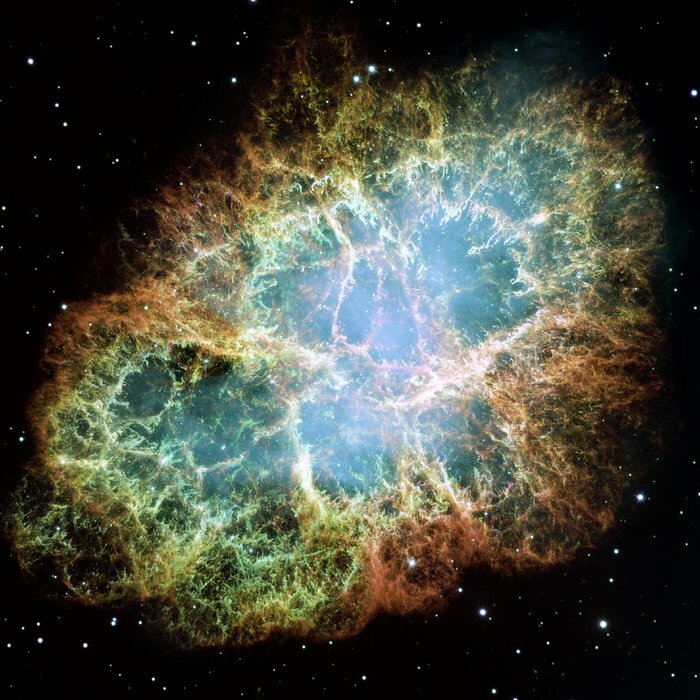 Both explosions are known as supernovae – violent cosmic catastrophes. 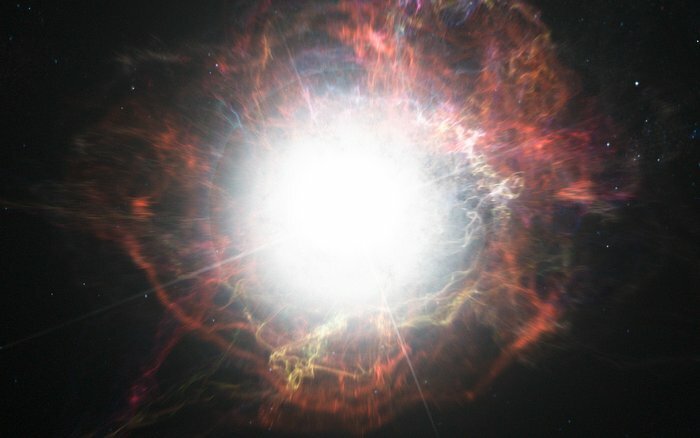 Dust factory: Most of the dust particles in the Universe are produced in the aftermath of supernova explosions, when gas cools down and condenses (artist‘s impression). 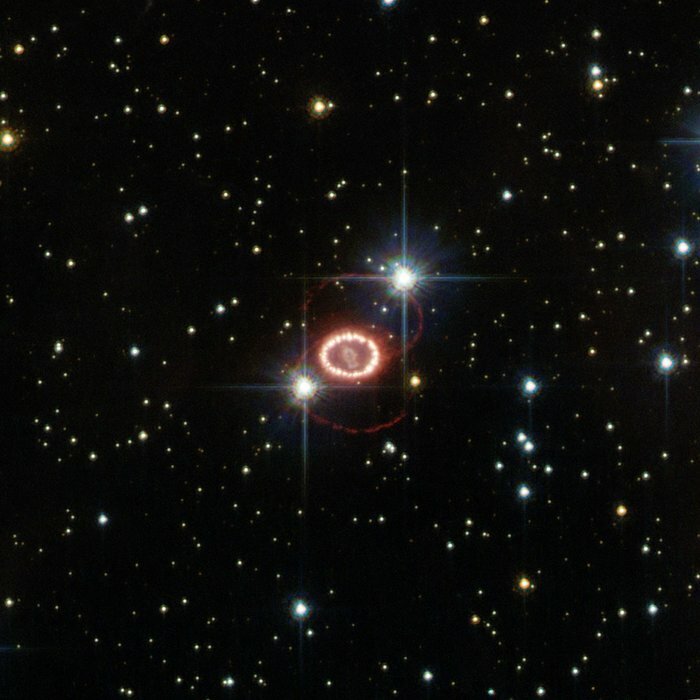 Supernova SN 1987A: Supernova SN 1987A was one of the brightest stellar explosions since the invention of the telescope more than 400 years ago. Bright beacon. Supernova SN 2004dj (upper right corner) shines almost as brightly as the nucleus of its home galaxy, 12 million light-years away. “Nova” is Latin for “new”. But a supernova is not the birth of a new star. Instead, it is the death throes of a massive star that has reached the end of its life. Nuclear fusion in the stellar core comes to a halt. The core collapses, and most of the star is blown into space – a Type II supernova. Type Ias are different: they occur when a white dwarf star gathers matter from a companion, passes a threshold mass, and detonates. Throughout the Milky Way, there are about two supernovae every 100 years. Lose, then explode: A red giant star explodes as a supernova after huge amounts of gas have been shaved off by its hot blue companion star. An exploding star is called a supernova. It’s either a giant star ending its life, or a white dwarf that becomes too big. A supernova briefly shines as brightly as billions of suns!